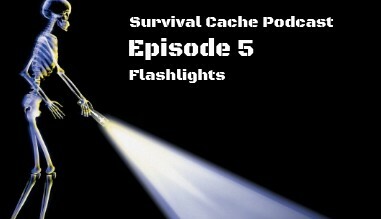 In Episode 5 of the Survival Cache Podcast, Doc Montana and Drew geek out over survival lighting & all things flashlights. Both Doc and Drew have extensive knowledge on the subject matter, and review everything from flashlights to lanterns to batteries to solar-powered illumination to area lighting. When things go south and it starts to get dark, you will be glad you invested in a good set of flashlights (two is one and one is none). It’s a great episode for those of us looking to upgrade our lighting situations, check it out! A fun episode with lots of opinions – download, listen, and chime in on the topic!